Abstract: This is the first of two papers investigating the development of a silent attachment mechanism based upon a natural hooked structure. The process of study follows S N Gorb’s prescribed process of morphological study, material properties, mathematical modelling followed by two additional processes, material selection and design (Paper II). The subject selected as an initial structure was the burdock (Arctium minus) hook. The process of acquiring confocal images of the structure is described in detail as well as an alternative approach using a microtome, 2-D digitising and Solid Modelling software. The opportunity was taken to confirm Gorb’s hypothesis with regards to the shape optimisation of plant hooks. The stresses through the hook during tensile testing are described diagrammatically and a reproduction of the hook is rendered and modelled using Solid Modelling. The behaviour of the hook under load is modelled mathematically. There is some incidental discussion included as to the potential uses of confocal microscopy in biomimetic nanotechnology research. Figure 1). In order to make a comprehensive study of a biological structure all aspects including ecology, material and method of functioning must be studied. To utilize this for the purpose of producing a product with prescribed properties requires further material science and a knowledge of associated manufacturing capabilities. Modern biomimetics can afford to re-address previous studies of biological structures due to the development of modern techniques in microscopy, rapid prototyping and composite materials, particularly in the light of modern demands for miniaturization and the availability of new lightweight composite materials. The question of intelligent design and perfection in nature is taken to have been addressed by the work of Allmon and Ross (1990) as cited by Nicklaus [‎3] and by Howe and Smallwood (1982) [‎4‎4] and S H Bullock (1997) [‎5] and it is therefore sufficient to merely state here that for the purposes of biomimetic study, biological structures must be treated as they are without regard to their origins or reason for being and examined for design indicators that can be utilised for the purposes of modern design and manufacture. To assume perfection in Nature’s design is a fallacy. All that can be assumed about nature’s designs is energy efficiency with available materials. TRIZ was developed by a Russian patent clerk, an engineer by training. As a design algorithm, TRIZ implementers appreciate that it is unusual in that it does not often present a range of solutions. Instead the algorithm presents a directed best solution. It also indicates trends in design and technology and it can be a useful and fascinating tool. TRIZ as it is applied to biological structures and mechanisms has a parallel with the intelligent design argument. The TRIZ design approach that indicated a natural solution would indicate that this solution was the best solution. But only a zoologist or a morphologist would, it seems, really consider this to be the case (see D’Arcy Thomson “On Growth and Form” [‎6] Chapter 1). The best that an engineer/scientist can hope for is a physical or chemical property that can be exploited or mimicked in some fashion. But this could be an example of engineering prejudice, for how many biological structures and mechanisms have truly been studied with our “new eyes”? However, one is still presented with a conundrum. What criterion is best applied in these days of environmental awareness? What criterion does one use to judge a best design? Certainly it would seem that biodegradability, low cost to manufacture with the minimum of environmental impact are of optimum significance if one is considering mass production. For products with more specialized purposes there would seem to be other criteria to apply, of need justifying economic cost. And there is also the question of application. Do we need another plastic attachment mechanism? What do we need and what does the market need? What appeals to the consumer? TRIZ appears later in Part II for, if one considers that a biological structure is efficient in terms of material and energy, then the problem for an engineer with regards to biological structures is to apply TRIZ in reverse, to recognize what one is seeing and find a place for it in technology. For more on TRIZ see [‎7]. Figure 2 above comes directly from the Vincent and Mann paper. 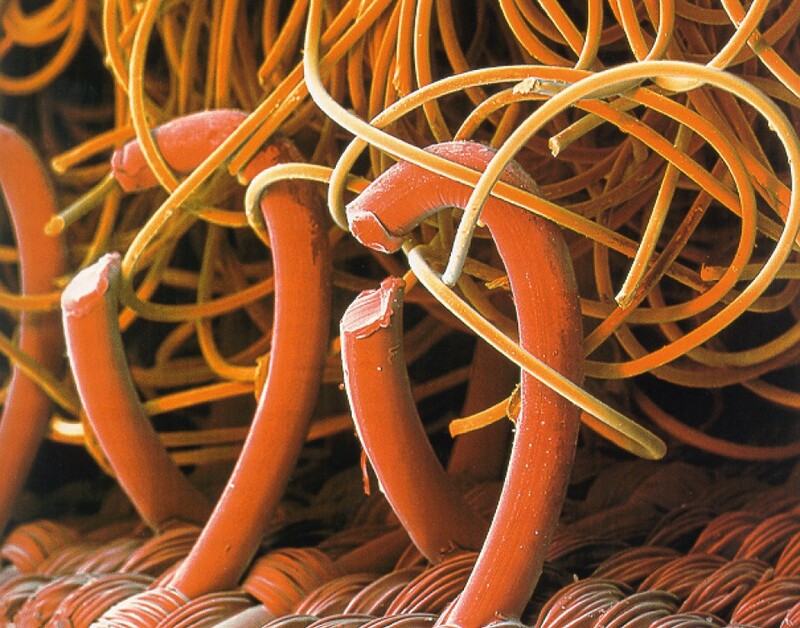 Note the area that Velcro occupies, an attachment mechanism of relatively medium strength and re-usability (see Figure 3 – Commercial Velcro from [‎8]). The stated aim of this research project was to design an attachment mechanism using hooked structures that would occupy a space with the additional pre-requisite that it would be silent in action. It did not say to use burdock as a reference to produce this attachment mechanism. But, given the research that S N Gorb has already devoted to cellulose hooks, Arctium minus is a suitable example to use to illustrate and enhance his methodology. This, Part I, demonstrates Gorb’s technique and Part II is devoted to material selection and product design and development. D’Arcy Wentworth Thomson’s book “On Growth and Form” [‎6] is a treasure to a biomimeticist and it should be considered a “must read”. The entire Chapter 2 is devoted to magnitude and what he describes as “The Principle of Similitude”. In the case of natural hooked structures, many of the examples in nature are very small, so small (~100mm) that these factors become significant in the action of attachment and the attachment force. The burdock hook (radius of curvature ~ 250mm, shaft diameter ~ 200mm) is desiccated when mature, without any secretory organs. The full action of mechanical interlock can take place in a completely dry environment thus the scaling effects are limited to those of size, friction and gravity. As has been discussed by Thomson, forces such as inertia become small enough to ignore whilst others are magnified in their effect. It is common in nature, particularly in structures approaching the molecular in size, to find that it is a combination of properties that act coincidentally that produce an effect. These are fully discussed by Ashby and Johnson [‎11] and elements of their work shall appear later in Part II. It provides more structural possibilities for tuning the load attachment relationship. Fast and easy attachment and detachment are possible. Fabrication of surfaces at the microscopic scale is possible (this makes it useful for design of microfasteners for MEMS applications). Upon reading the above immediately one is struck by the notion that searching for a silent Velcro of hooked structures could be an error. But this does not take into account the possibility of distorting the biomimetic ethos for the purpose of satisfying the end goal and for this purpose the research will continue, turning to examine suitable artificial materials that may satisfy the goal at the risk of sacrificing an element of marketability. A silent re-usable hook-shaped attachment structure may exist in Nature, it is foolish to discount the possibility. With reference to Figure 4 above in the final solution sacrifices will be made in terms of financial viability and need in an attempt to fulfil a brief that is not necessarily realistic. On this journey a number of other possibilities will be explored although none to the extent of given challenge. But the true method is to study each mechanism in turn and to collate the possibilities of each with out the limitations of a prescribed goal. Investment Climate and Business Strategy will be ignored as will be certain elements of Industrial Design and Production, Use and Disposal (see Part II). This is biomimetics in its purist form and commonly one or more of the steps are discarded in the evolution from biological structure to product production. It also makes the assumption that no secretions are involved and that one is purely examining a dry structure therefore there is no role for a Chemist or Biochemist for adhesive study in the above. Steps one through to three describe the scientific, biomimetic study of a biological structure. Steps four and five have been added to describe the implementation of the structure in some product. Naturally Arctium minus is not the only example of plant hooks in nature. Other members of the Arctium family produce hooks such as Arctium aves, Arctium lappa and plants of separate families (see Figure 5 to Figure 8 below), but as noted previously there appears to be no biological imperative for the shapes of these hooks to be as they are. These structures are functional survivors that may yet fall by the evolutionary wayside. The following examples were drawn from Nachtigal [‎14]. Higher plants use a variety of dispersal agents such as wind, water, animals and people. Dispersal by animals is known as zoochory. Dispersal by fruit-eating animals (frugivores) is known as endozoochory or by ants is known as synzoochory [‎19]. In terms of the plant’s life cycle, the hooks become operational early in the year, acting as a defense mechanism while the immature seeds develop. At this stage the tensile force required to remove the fruit from its supporting stem is at its highest. The corolla or flowers are in evidence at the apex of the fruit, protruding from the basal cup comprising of the ovary and surrounding bracts. This fruit is green and the hooks are already developed. As the fruit matures the corolla withers and then disappears. 10-15 seeds are present in the ovary and these are freed by the total disintegration of the fruit which begins immediately the fruit is separated from its host plant. Each of the bracts is flattened at the base where it originates, becoming narrower to form the shaft of the hook. This means that each hook has a single degree of freedom which, from Gorb [‎19] has implications for its attachment ability, decreasing the contact separation force and increasing the propensity of the fruit to attach. As the plant and its seeds mature the entire plant desiccates and becomes brittle. The detachment force required to detach the now brown fruits and the mature seeds they contain reduces to a load far below that of the fracture force of the hooks and the fruit freely attaches itself to passing hosts. The chosen structure of interest is the burdock hook. For the purposes of recording a structure’s shape an engineer acting as a biologist is faced first of all with discerning what is the best shape to study since the variety of nature presents him with a range of sizes and shapes that are commonly described using the statistical analysis techniques of a field biologist [‎20]. Therefore a conscious decision is made to abandon averages in favour of selecting a typical member of the group and examining it in isolation. The first method of shape recording selected was the use of confocal microscopy. This method has a particular attraction due to the fact that specimens need only be mounted in a distilled water solution and the examination is non-destructive. There is software available on the market that allows for file conversion to .stl format required for a rapid prototyping device. Further, with regards to finding some method of recording shape, it followed that it was reasonable to avoid the tiresome and inaccurate prescribed methods of searching for radii of curvature used by Dai, Gorb and Schwarz [‎21] in their work on insect tarsi in favour of direct data acquisition (see Figure 12). This is explored by Beraldin et al [‎22] for virtual reality applications.However, confocal microscopy really only allows for an examination of external morphology of an opaque structure. In the case of burdock it was a reasonable assumption that the hook was comprised of solid plant material and that it would fluoresce naturally under the laser light. In other words there were no hidden interior lamellae and the chlorophyll present would still be reactive to the wavelength of the laser light. The following procedure is described by Sanson et al for the production of cubic voxels and virtual reality applications from his paper on the imaging of mammalian teeth [‎23]. It essentially notes how to take a suitable image of a small object (~mm) for the purposes of digitizing, reproduction and study in virtual reality. The main benefits of using the confocal microscope are i) speed ii) ease of mounting the specimens and iii) accuracy at a micron scale. Confocal microscopy and atomic force microscopy both allow for specimens to be mounted upon a slide using distilled water as a medium. Sanson et al used a resin casting of their teeth specimens which was coated with eosin, a fluorescent dye. Figure 13 shows two image slices obtained without any post-processing. The outline of fluorescence is clearly visible. A specimen burdock bract was mounted upon a “well” microscope slide in distilled water (it is a feature of both confocal and atomic force microscopy that specimens are mounted easily without much treatment) and placed under the objective of a confocal microscope (with thanks to Ian Jones, the technician in Neuroscience in the Biology Department.). When suffused with the laser light at three different frequencies it was found that the burdock hook fluoresced well under the green laser light (note that the cellulose hook is brown in colour, not green as the reader might suppose, see Figure 9 previously). Under the red and blue light the resulting image was less distinct. The stacked image is then output to file and stored as a sequence of .tif files that are viewed in .avi format (see below for the full range of .tif images). Stereogram images of the hook follow (Figure 14, Figure 15 and Figure 16). The data from the confocal microscope is a sequence of image slices that are then automatically reassembled (stacked). Evidence of the stacking can be observed in the images from the stepped outline of each image. The individual .tif images that make up the above stereogram are below (see Figure 17). The glow that surrounds the stereogram images derives from the fact that this view of the hook is assembled using standard confocal software and the viewer is looking through preceding and following images which are a result of the perspective of looking at angled images. Only in a profile image does a stark outline of the hook show. There is an artefact on the microscope slide that shows to the side of the hook. 6. 7. 8. 9. 10.11.12. Note that the images from the confocal microscope show some internal structure of the hook, particularly the cellulose microfibrils. These microfibrils are visible in the next experiment which fractures the hooks in a tensile tester. The hooks are made up of cellulose fibres bound together with hemicellulose to form microfibrils. There is an absence of lignin (another binding saccharide) in the hooks. It is appropriate to consider an alternative means of collecting morphological data on the hooks. This comprises of using a microtome and a digitizer with a finite element package such as Solid Modeling. One begins by taking into account that one shall be using a Solid Modeling feature known as “loft”. This requires what is known as a “path” which is a digitized spine along which a number of cross-sections shall be distributed prior to rendering of the object in 3D. Digitizing the upper and lower profiles provides for a smoother model. Thereafter, using the microtome to section at predefined and measured intervals along the profile, a number of cross-sections are taken and each digitized. Each section is preserved so that the sectioned material can be inspected. The data is transferred to the Solid Modeling package to reconstruct the hook in 3 dimensions. The advantage to this form of morphological recording is that it is cheaper – the digitizer, microtome and software are relatively commonplace, the digitized sections are distinct and internal detail is revealed by the sectioning and this can be included in the reconstruction. Alternatively, and this has been used for the following reconstructions, a simple silhouette can be used, measured and reconstructed. It was assumed each profile was circular, a close enough approximation for the purposes of this paper. Using Figure 18 it was possible to digitise two splines for the inner and outer profiles. Diameters were measured perpendicular to the inner spline and used to reconstruct the hook using the loft feature, of which four views are shown below (see Figure 19 and Figure 20). With further work in SolidWorks it will be possible to merge the base of the hook with a flattened sheet thereby emulating the bract from which the hook arises. This would produce a jointed hook similar to an example which is discussed in Section ‎4 concerning the testing of the Galium aperine fruit, by Gorb et al. From there, it would be interesting to use a simple sphere as a support to reproduce an authentic likeness of the burdock fruit not necessarily to scale due to the limitations of manufacturing technology. But this is for later discussion in Part II. In Chapter 5 of his book “Growth and Form” D’Arcy Thomson describes the nanostructures associated with the genus Radolaria, microscopic aquatic organisms that assemble their own minute skeletons through a process of cellular adsorption. They have a seemingly infinite variation of shapes including single and double hook shapes which occur at the interstices of cellular assemblies. Thomson also makes mention of experiments that have been conducted into the shape and form of soap bubbles and their resemblance to natural cellular low energy configurations. This is particular of corals, for example, where calcium carbonates and silica precipitate from the cellular material and in fact of all living organisms that have skeletons. It is known that the self-assembly of nacre has been successfully artificially replicated [‎24]. The question addressed here is not the mechanism for self-assembly, but the measurement of a structure without interference with its growth. If one considers the medium in which the specimen is mounted: distilled water, it prompts the question, would it be possible to use a confocal microscope in a liquid medium other than a microscope slide? For instance, many sea creatures require the supporting medium of the ocean to support for their body mass. The family Radolaria of which over 400 species are known, are single cell organisms with an internal structure formed by the deposition of organic molecules. Chapter 5 of D’Arcy Thomson delves deeply into this issue, of colloids, cells, adsorption, spicules and snow-flake like skeletons. To the curious eyes of this scientist it would seem that he is talking about a form of self assembly of structures and some of these are distinctly hook or anchor shaped. And they are formed in a scaffold of bubbles or cells, that is, a liquid medium. A confocal microscope could be a non-invasive technique of inspecting the growing structures without disturbing their growth. Secondly, would it be possible to use the confocal microscope images together with a photolithographic effect to impregnate synthetic membranes with phyllic substances to form a scaffold sandwich for the purposes of self-assembling nano- and micro-structures without recourse to genetic direction? What better way of producing a synthetic biomaterial than to use the same material that comprises the mimicked structure? More discussion upon this possibility appears in Part II. Having captured the morphology of the hook, the next part of the investigation as prescribed by Gorb is to investigate the material properties. This must include both the hook and the substrate for biological purposes. For engineering purposes, the natural substrates of burdock (fur/hair) have already been much studied as will be seen later. The following experiment into the contact separation forces of the burdock hook draws upon two papers by Gorb et al which are described in detail in the introductory discussion. To investigate the fracture force of hooks from the plant genus Arctium minus or common burdock using an Instron tensile testing machine to observe any telling differences that could be observed from the conclusion of Gorb that the span of the hook was the significant factor in contact separation force by testing specimens of different radius of hook collected from burdock pods of varying diameters. Further, to observe the nature of fracture of the composite biomaterial and to use this information in developing a design hypothesis for the design of optimum performance hooks and attachment mechanisms. These are described in depth in the following pages before proceeding with the experiment itself. 4.2.3 “Natural hook-and-loop fasteners: anatomy, mechanical properties and attachment force of the jointed hooks of the galium aparine fruit”, (2002) E V Gorb, V L Popov, S N Gorb [‎19]. This is a study of the jointed hook of Galium aparine, this form of jointed hook not being found elsewhere in nature. The hook is described as to exist in two parts, a hooked cone and joint-like base. The joint is actually a zone of “hollowness” at the shaft base which allows the hook to flex in any direction. Force testing is carried out using a micro-force tester and by using a mathematical model describing the hook geometry it was found that hooks with and without a base had different elastic moduli. (see Figure 22) Further experimentation showed that hooks with joints are better able to adapt to forces in different directions, they bend more easily and resist damage due to the hinge at the base of the shaft. Semi-thin sections were embedded in resin and stained with safranin and fast green, showing that the hook walls contain cellulose and lignin. A combination of light and scanning electron microscopy was used. There is detailed description of the methods of fixing the specimens for examination. A 3-D model was obtained of the fruit using digital images of longitudinal and cross sections. Wall thickness was measured by cross-sectioning at different levels and using light microscopy to digitize the images. The paper described in Section 5.1.3 was used to supply the data for contact separation forces (see Figure 22 below). The same force tester used in the previous paper was used here. There is a description of how to derive the material properties using the same force tester. This consisted of applying a transverse force slowly to the specimen, in the region where the specimen begins to curve to form the hook (see Figure 23). The shaft is deflected by the transverse loading. The loading head is then halted and held in place. Over time the loading on the shaft decreases indicating the material exhibits visco-elastic properties because the elastic force relaxed over time. “…joints provide a higher chance of initial interlocking of fruits. Even if only the apical part of the hook is attached, an initial interaction force may lead to proper interlocking.” Further, this joint effect is simulated in nature by hooks not found on the side of the fruit facing the contact surface because the flexible base allows other hooks to become engaged and contribute to the attachment. It is stated that this joint effect is unknown in industrial hook-and-loop fasteners. This effect can be seen in Arctium Minus in terms of the flattened bract from which the hook emerges, lending a degree of flexibility to the attachment which Gorb’s paper says results in a reduced contact separation force but an increased propensity to attach. Gorb does not suggest an explanation for the reduction in contact separation force for the artificially jointed hooks compared to those that had been glued to the test support. Figure 25 shows the equation derivation for the hook displacement as a function of the applied force, from which Young’s modulus is calculated from the experiments illustrated in Figure 23. The bending moment equation is applied considering the shaft of the hook to be a tapered shaft with walls inclined at a constant angle q to the vertical with wall thickness h, shaft length L, deflection y measured and force F being the applied transverse force (see Equation 7 in Figure 25). As in the previous paper Kruskal-Wallis one-way ANOVA on ranks was used with P<0.001 and Dunn’s Method of pairwise multiple comparison (see [‎20]). These detachment values were then related to physical dimensions that could be compared in the structure of the burrs. In other words, morphological variance of the burrs was examined and estimated (burr length and burr diameter at the basal part, see Figure 26) and the dependence of the force on the size and morphology of the burrs was examined for each species and then compared between species. The number of burrs to hold the fruit in place was counted and compared as well. Figure 27 shows the fine detail of the surfaces of each burr as has been described in the text for each of the burr species. Such close examination is necessary in order to note microscopic structures that might supply additional anchorage to the burr. It shows the similarity in hook morphologies with that of burdock but it also shows the difference – these hooks do not arise from bracts. The contact separation force of burdock was found to be closest to G. urbanum (see Figure 29, Figure 36 and Table 1). With reference to Figure 28, the top graph is the separation force of a single burr relative to fruit weight. The second graph shows the interrelationship between the minimal number of burrs to hold the fruit in place, the separation force of a single burr and the fruit weight. The final graph shows the summation of the force of all the burrs covering the fruit versus the fruit weight. Figure 29 shows the contact separation forces for each of the species of burrs. It shows the actual distance moved by the lower test platform. This test was copied in the laboratory (see Section 5.1.4) using an Instron tensile testing machine. The second graph shows the mean values and standard deviations of the contact separation force values. Figure 30 shows frames from high speed filming of the tests upon each of the four types of plant being tested. Note the loop of the micro-force tester beneath each of the hooks (as per the schematic diagram in Figure 31 below) and the horizontal dark lines on each if the images that indicates the level of the hook at commencement of the test. It would seem to show that tests A, B and C all were conducted using hooks in situ on the supporting fruit. In D this is not so clear. In Figure 31 the components of the micro-force tester are an upper platform (P) to which the sample is glued, a steel wire loop (LP), a glass spring (G). FOS is a fibre optic sensor that detects deflections in the spring via the mirror (M). In the data analysis, the Kruskal-Wallis test of one-way ANOVA on ranks was used followed by Dunn’s method of pairwise multiple comparison between series (SigmaStat 2.0 for Windows)[‎20]. 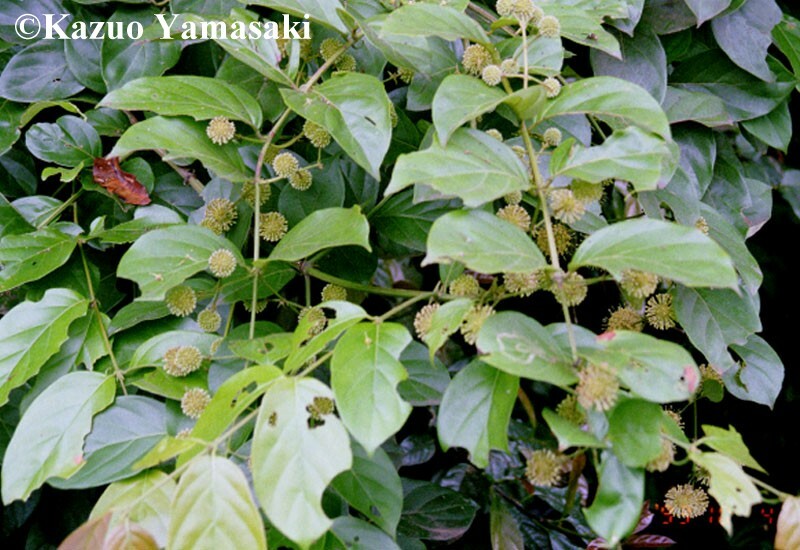 To calculate dependence between different morphological burr variables measured, linear and exponential regressions were applied. The ANOVA statistic (F) was estimated for the regressions. The F-test statistic gauges the contribution of the independent variable in predicting the dependent variable. It is the ratio between the regression variation from the dependent variable mean and the residual variation about the regression line. The paper concludes with asserting that the separation force depends primarily on the shaft length and secondarily upon the radius of curvature of the hook. Because there was no opportunity to measure the elastic modulus of the burdock hooks it was decided that the figure obtained by Gorb for Galium aperine fruit would be a suitable approximation, namely for wood from 7 – 15 GPa depending upon the relative composition of cellulose, hemicellulose and lignin. It is interesting to note that in SolidWorks, although some 9 or 10 types of wood are specified in the add-on CosmosWorks, none of these woods include a Young’s modulus for FEA purposes. Ten individual hooks were taken from the dispersed hemisphere. These were mounted in preparation for testing in the Instron machine by gluing each separate bract to a plastic mounting with 5mm of the bract shaft with its hook extended and exposed for interaction with a testing substrate (in this case a loop of silk thread as will be discussed). (see Figure 33) The extension was set at 1mm/sec using a 1N load cell. Each specimen was mounted with 5mm +/- 0.3mm of shaft exposed, with the idea that all shaft lengths would be equal. Gorb states that the shaft is the first main constraint of a hook’s strength since the strain increases in proportion of shaft length. Thereafter, hook diameter is most important since the larger the diameter, the greater the thickness and therefore strength of the component material. Overleaf are the results for tests on approximately 60 specimens, from 6 different burdock fruits (see Table 1and Table 2). Figure 34 shows an example of the mounted burdock hooks, glued so the each has a shaft length of 5mm. Figure 35 shows the detachment force of each set of specimen hooks. The mean value of these results for each specimen is plotted versus the diameter of the fruit. Figure 30 previously since the testing and resulting deformation are the same as those recorded during these tests by Gorb. The SEM images of the fractured hooks (Figure 37) clearly show the fibrous nature of the hook material and the fracture surface indicates the material properties, noting how the inner surface of the fracture surface fractures squarely with no fibre “pull-out”. From Prof J F V Vincent’s notes on the mode of fracture of fibrous composites from [‎27] the lack of fibre “pull-out” indicates that the fibre/matrix interface of the plant material consisting of cellulose microfibrils, hemi-cellulose and lignin is tightly bound. Figure 38 shows a typical hook fracture. In this case the hook “head” did not become completely separated from the shaft, being retained in place by a thread of material, having folded back onto itself to release the loop of thread before separating completely. With reference to Figure 35 (the graph of fracture forces) it can be seen that the hook fracture forces are all of the same order of magnitude but that there is a levelling of the slope in the region of the diameter equalling 20mm. The specimen size ranged from 14mm to 26mm in diameter with a gap in the spread of specimen diameters in the interval between 15mm and 23mm. This gap appears as the step in the graph. The force results agree with Gorb’s conclusion that increasing hook span indicates a greater force to separation. The separation force levels out at 1.2 mN which can be taken to indicate the ultimate tensile strength of the cellulose microfibrils an the point at which the crack accelerates across the fracture plane and the hook disconnects from the tip of the shaft or folds back sufficiently enough to release the loop. Reference to Figure 36 shows that this force falls within the expected range compared to similar hooks tested by Gorb. Gorb clearly states the statistical methods that he used: Kruskal-Wallis one-way ANOVA on ranks with P<0.001 and Dunn’s Method of pairwise multiple comparison which allows comparisons to be made between any number of sample means, all in a single test. The P value is the acceptable significance. For further information on statistics for biologists see [‎20]. However, due to the nature of this experiment, based upon a single species, burdock, it was deemed that such statistical methods were unnecessary particularly as the investigation was to confirm a hypothesis already made by Gorb, that span was the dominant parameter. The basic assumption was made that an increase in the diameter of the fruit would correspond to an increase in the radius of the hook. The test images using the high speed camera were similar to those from Gorb’s paper [‎26] and not fast enough to capture the actual fracture (due to the speed of fracture). This experiment confirms that the separation force of a natural hooked structure is dependent upon the span or radius of a hook. From Gorb et al [‎26] the separation force is not the same for all cellulose hooks. This can be accounted for by variations in material composition and/or structure from species to species. But within the hooks of a single species the hypothesis holds true. It could be assumed in mechanical design of a hook that the smaller the span of the hook the higher the separation force since this would reduce the bending moment due to the tensile force but in biological hooks there remains the proportionality in sizes which negates this possibility. In other words a hook with a disproportionately thick shaft and a narrow span would be a mutant. The results all came within the range expected for a separation force, of 0.8-1.1 mN. In evaluating the strength of a material in engineering terms it is necessary to assess its ratio of stress to strain which is known as Young’s Modulus. Gorb demonstrates this technique in his paper on the Galium aparine fruit [‎19]. By using the standard formulae for bending stresses and applying a known horizontal load at a prescribed distance from a fixed base he was able to measure the deflection and thereby calculate the Young’s Modulus of the material. For the purposes of measuring the deflections of a very small and fragile hook he makes use of a micro-force tester with a sensitive glass spring and a fibre optic sensor to detect deflections. This was not available at the time of experimentation but the similarity between the results obtained for burdock to that obtained by Gorb for Galium aperine makes it possible to use the standard figures for cellulose, hemi-cellulose and lignin (7 – 15GPa). The natural fibres that host burdock include the fur and feathers of species indigenous to the UK. Data on these substances is readily available. . Hair is made of keratin. Keratins form a group of varied proteins which contain significant amounts of sulphur cross-linking and stabilizing in the material. It is found in horn, hair, hoof, feather, skin, claws etc. The types of keratin include mammalian, avian and others such as reptilian. From personal observation of a demonstration at the London Science Museum, natural hair is surprisingly strong in tension. It is reasonable therefore to assume that when a burdock fruit is “groomed out” of an animal’s coat by a biting action, the hook will fracture unless by a clumsy grooming action the animal removes fur in the process. Gorb develops a static model for parabolic fasteners, assessing the interactions of two surfaces including the interaction of opposing teeth and of adjacent teeth in the field in terms of geometric variables. The static model of a single hook and fibre is simpler and no different for a complex of hooks based upon the fact that their interaction does not affect the hook’s loading. The mathematical model is developed below. It is noted that in the experiments each of the hooks fractured before the loop came free of the hook. This means that the hook material is not resilient enough to sustain the deformation necessary to release the loop of thread and reform their shape. For the case of parabolic fasteners the interactions between elements adds a component to the attachment force [‎12]. With reference to Figure 39 above this is not the case for hooks since under loading the hooks straighten and their interaction reduces. This is not to say that their interactions are insignificant since the density of hooks in a field of structures will affect the success of attachment occurrence and he total load that can be supported. The direct load F has two components, Fn and Ft.
Let the Young’s modulus for the hook be E.
0o < a < p/2. The more direct the force application the smaller the size of a but as the hook deforms so a will increase. r = the distance between the centre of force application and the point on the Neutral Axis (N.A.) where the stress is zero i.e. the lever arm. As the hook deforms and a increases so the lever arm r decreases in length. And they both are components of the applied force. As the hook straightens under load the angle a reduces to 0o and Fn becomes equal to F, the applied load and the load upon the internal cellulose microfibrils becomes a direct tensile load. where r = bending moment lever arm. where A = cross-sectional area of the hook. From the results of the experiment we know Ff, Af and we can find sf. If we measure ef, the strain to failure, we can calculate E which leads to an ability to specify a suitable biomimetic material. Applying this theory in reverse for a known material it will be possible to predict the stress that a manufactured hook can withstand prior to failure for known hook dimensions. In the plant kingdom, with regards to plant growth and evolution, only energy efficiency can be assumed with regards to structure. All structures are governed by the same basic physical and chemical laws. This implies a direct link between material composition, morphology and function but does not necessarily indicate a best overall solution to a prescribed problem. It is surmised that in the exploration of micro- and nanostructures there is a justifiable expectation that the manufacture of microstructures will be possible in the near future. This is likely to take place through the self-assembly of organic and inorganic molecules in bio-reactors. It was confirmed in the experiment on Arctium minus that S N Gorb’s conclusion with regards to composite hook strength, that shaft strength and then hook radius was of primary importance, held true and that the Young’s modulus of the Arctium minus hooks fell within the known range of cellulose. It was concluded that functionally, burdock hooks are single use only and that the originating bracts, from which the hooks form, act as a single degree of freedom hinges thereby aiding attachment in conjunction with other hooks on the fruit. It was observed that unlike Velcro, burdock hooks have a pointed tip and their hooks are thin enough in silhouette to combine a hooking function with a piercing action. It was noted that burdock hooks are assembled in a spherical field unlike Velcro hooks which are assembled in parallel fields on a flat plane. It was noted that the diameter range of known natural host hair fell between20 and 100 microns in diameter, all consisting of the material a-keratin. It was observed that burdock hooks have a radius or curvature of between 50 and 150 microns and that cellulose microfibril alignment is all parallel to the direction of the hook. Lack of resilience (single use). The component material will be formable. The component material will be a composite. The component material will be biodegradable. The hook will have a single hinge. The product will have a dual functionality which will be either piercing and hooking or slicing and hooking.